The Krugerrand was first minted in 1967 as a way to market South African gold. 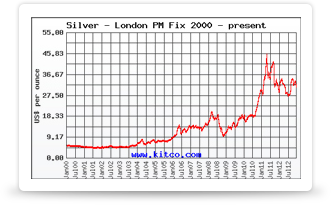 By 1980, it accounted for more than 80% of the global gold bullion coin market. To date, nearly 50 million ounces of gold have been sold in the form of Krugerrand coins. The immediate success of the coin encouraged other countries to issue gold bullion coins of their own, such as the Canadian gold Maple Leaf, the Chinese Gold Panda, and the American Gold Eagle, all of which were introduced between 1979 and 1986. 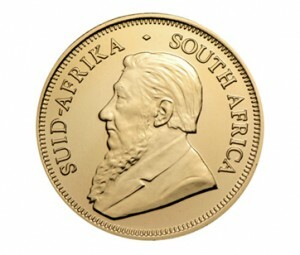 Produced by the South African Mint, the coin features President Paul Kruger (1825-1904) on the obverse. In this 1967 design by Otto Schultz, Kruger’s image is depicted along with the name of the country in both English and Afrikaans. The reverse features a springbok antelope, one of the national symbols of South Africa, along with the date of the coin. This design was created by Coert Steynberg, and was previously found on the South African five shilling coin. The name of the coin is a combination of “Kruger,” whose image is found on the obverse of the coin, and “rand,” the currency used in South Africa. The one-ounce version of the coin is 32.77mm in diameter, and 2.84mm thick. Its actual weight is 1.0909 troy ounces (33.93 grams), so that the weight of the gold contained in the coin is exactly 1 troy ounce. Its composition is a gold alloy consisting of 91.67% gold (22 karats). The remaining 8.33% (2.826 grams) is copper, an alloy that has long been known as “crown gold.” This gives the Krugerrand a harder, more durable surface than pure gold coins, enabling it to better resist scratches and dents. The copper content gives the Krugerrand an orange hue when compared with pure gold coins. In 1980, three smaller sizes of this coin were introduced, containing ½ ounce, ¼ ounce, or ½ ounce of gold. All feature the same design as the one-ounce version. As with the one ounce coin, the actual weight of the coin is higher to account for the copper in the alloy. These fractionals make owning gold coins more affordable. They are also favored by those who invest in gold for the purposes of bartering or to hedge against the eventual collapse of the currency system. The South African Mint also produces limited-edition proof versions of the gold Krugerrand intended as a collector’s item. Priced above the bullion value of the coin, they can be distinguished from the bullion Krugerrands by the number of serrations on the coin’s edge. Proof coins have 220, while the bullion coin has 160. 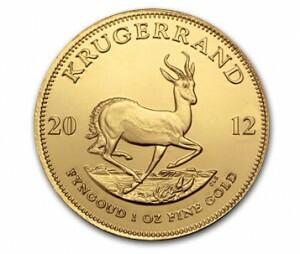 The pricing of the Krugerrand is based on the current spot price of gold, plus a small per-coin premium. In recognition of this fact, Krugerrand coins are not marked with a face value in rand, unlike many other gold bullion coins which are marked with a symbolic face value that does not reflect the actual market value of the coin. Recognized internationally, the South African gold Krugerrand coin is a popular way to invest in gold. The first gold coin to contain exactly one troy ounce of gold, the South African Krugerrand is recognized as the original modern gold bullion coin. Extremely liquid and easy to trade internationally, the Krugerrand is noted for its high level of recognition worldwide.